There are lots of different ways to be involved with Friends! To start, sign up for our e-news to get updates on river news, policy updates, and fun events. Follow us on Facebook, Twitter and Instagram for great photos, videos, and fun activities occuring at the Chicago River. 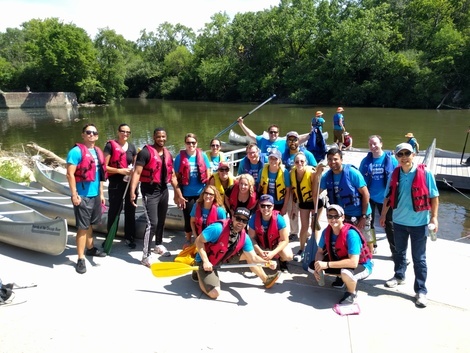 Whether you’re looking to get your hands dirty or help plan special events, Friends of the Chicago River would love your help! 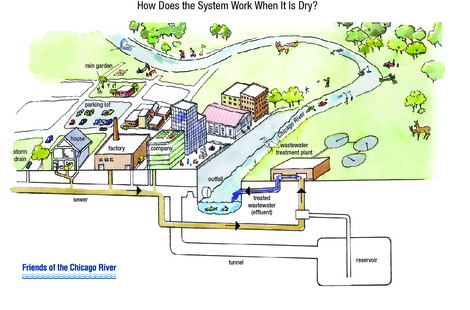 First, get on the same page with the rest of the CREW, by becoming a Chicago River Eco-Warrior, (CREW). By filling out our volunteer questionnaire and telling us your interests, talents, certifications and availability, we can contact you with specific events which match your interests. Plus, you will get our monthly CREW emails to keep you informed of what's been goin' on, what's coming up and other important Friends updates. Read through our Volunteer Information Packet to get an overview of the River and the work Friends does and talk about Friends and the River to your friends, family and community! Word of mouth is proven to be one of the most valuble ways to increase our reach. Consider becoming a volunteer canoe guide. This is a serious commitment, but not with serious people! Our canoe program relies on the dedication of our all volunteer canoe guide team. It's a lot of fun, a great group of people, and an important way to connect people to the river. Download the application here. Email Annette Anderson, canoe program manager at aanderson@chicagoriver.org if you have any questions. Check out our events page to find out more about upcoming volunteer events, like Chicago River Day, restoration workdays and other Friends' events! 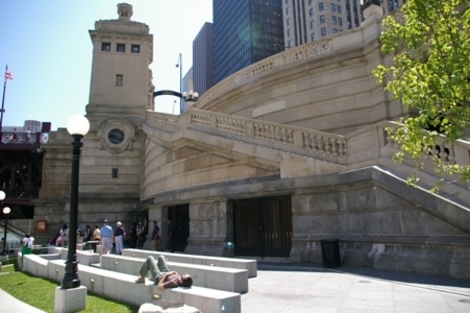 Learn more about the Chicago River by visiting the McCormick Bridgehouse & Chicago River Museum. Beginning at river level and spiraling five stories up, this vertical adventure provides a one-of-a-kind opportunity to explore a historic landmark bridgehouse.? Join us for a canoe trip. Paddling the river is so fun and it demonstrates to decision makers there is a demand the river to be used for recreation. Get fancy at the Big Fish Ball! The Big Fish Ball is Friends' largest fundraising event bringing together 500 leaders and young professionals from the Chicago community to the river with an amazing opportunity to engage with river wildlife and a delightful three-course dinner. The program honors recipients of the Chicago River Blue Awards, the highest achievement in river-sensitive designs along the river. Visit our events page to find more about upcoming events to attend. There things we can do everyday to help improve water quality and improve habitat. Here are a couple ways to be involved from home or work. Be the eyes and ears of the river: Know "Who to Call" when you see pollution in the river. Sign up for Overflow Action Days alerts. We will send you fun and interesting emails before or during a rain event with gentle reminders on how to conserve water as well as including interesting links, videos, and facts about water conservation. Please sign up and help keep stormwater and wastewater out of our waterways. Check out these easy ways to conserve water. Plant native plants like milkweed and prairie grasses with long root systems to help filter and trap rainwater and especially in the low points of your property consider a planting a raingarden. This will help keep water out of your basement too! Choose permiable pavers when renovating your landscaping to allow water to seep into the ground where it falls and keep it out of overloaded storm drains. Install a rainbarrel. Look around - there are often yearly programs offering them for FREE! Test your soil before fertilizing. This is the best way to get the beautiful lawn you want, by applying only the nutrients needed, keeping the excess out of our waterways. 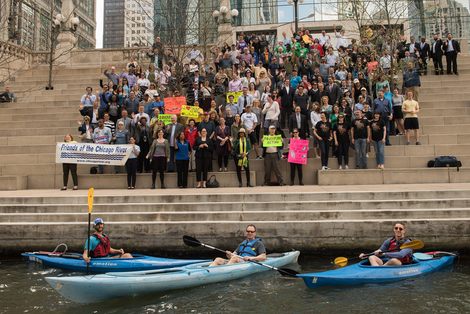 Help us make the Chicago River one of the world’s greatest metropolitan rivers! Support Friends of the Chicago River by becoming a member today. We are excited to share everything we know about the river and how to make it better for people, plants, and animals.